For the taco aficionados among you: Do not pepper me with hate comments about what constitutes a “real” taco. Take it up with the Indian Nations. For the politically minded, I acknowledge that the physical and cultural repercussions of making refined white flour a daily staple, is not something to celebrate, especially in communities stranded both literally and figuratively in the middle of vast food deserts. Like many foods we love, from latkes to lumpia, eating more isn’t eating better. But for those who are open to the culinary creativity of everyday folks, then this is food worth savoring. During your summer travels, look for stands located on busier strips near post offices, grocery stores or tribal councils. For the best fry breads, plan on arriving earlier in the day, as they will sell out. Peek around and see if there are cast iron pans at the ready. Each round of dough should be patted by hand and fried to order, and if it’s your first time, order a plain one to enjoy fry bread at its humblest. If you like funnel cakes, doughnuts, angel wings, or those little bits of leftover pie dough that your mom fried up just for you, then you’ll be right at home. 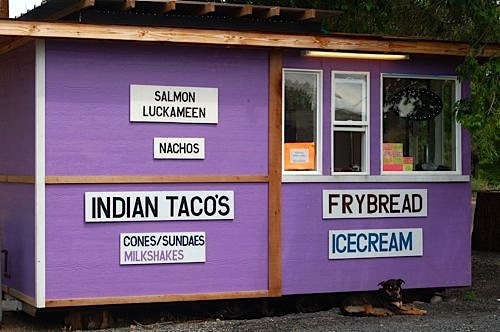 Many give Navajos of the Southwest the blue ribbon for making the best fry bread, but tribes all across the country have perfected their own versions. Some use baking powder; others have developed yeasty variations. Big or small, round or square, thin or hefty — everyone has their favorite way of making it. 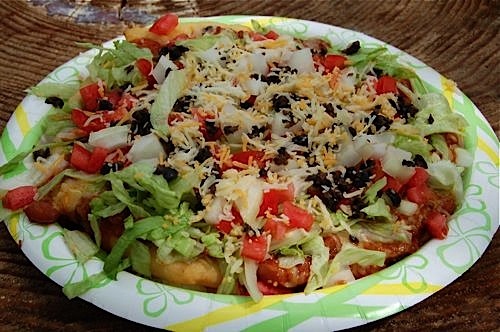 I wish I could say that fry bread has a happy history. Stories that includes broken treaties, prison camps and reservations, surplus commodities and starvation are not the ones usually passed around while we’re stuffing our faces. But like bitter parsley and unsalted bread, times of suffering are also passed from table to table with pride. We are here. We survived. We are together. We will prevail. 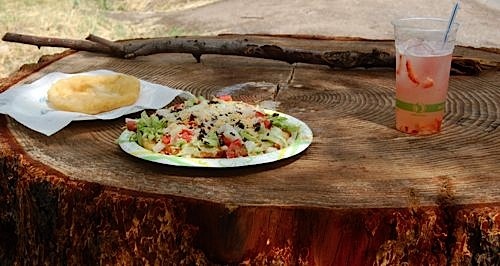 Pow wows are one of the best places to enjoy native foods. Celebratory gatherings, these were banned by our government until the 1960s, but fortunately, they now appear annually in every region. Search this pow wow calendar for California to see if you’ll be near one this year. Be sure it’s open to the public, and check for special events that the kids will especially enjoy. Fry bread is super easy to make, and kids will enjoy patting their own rounds. For a healthier version, try grilling the bread, another trick that is family friendly and even easier. This recipe is adapted from one that appears in the excellent book, Foods of the Americas, by Fernando and Marlene Divina, published in partnership with the Smithsonian National Museum of the American Indian. 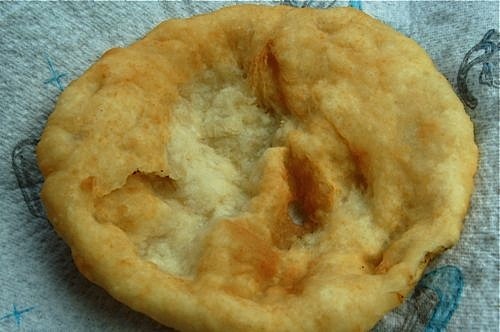 Fry bread is usually cooked until golden, without deep browning or char marks. You can sprinkle the rounds with cinnamon and sugar for a sweet treat, or wrap your favorite sandwich fillings for a savory meal. In a bowl, combine and stir together the flour, baking powder and salt. Make a well and then pour in the water. Form a soft dough, and then knead very gently and briefly to form a ball. Roll into a log, cover with a clean towel and let rest for 10 minutes. Cut the dough crosswise into 8 pieces, keeping the pieces covered while you’re working. Patting with floured hands and using a rolling pin, form rounds that are about 1/4-inch thick. Dust both sides of each round evenly with flour, stack and cover with a cloth until ready to cook. To fry: Heat 1 inch of oil in a deep, wide pan over medium-high heat. Cook 1 to 2 pieces of dough at a time, taking care not to overcrowd. Cook, turning once, until golden brown, 2 to 3 minutes on each side. Cook one first, and test for doneness before continuing with the other rounds. The fry bread should be dry and crisp on the outside, moist on the inside. Drain on paper towels and serve will still warm. To grill: Prepare charcoal or heat a gas grill to medium-high. After forming the rounds, place the dough on the grill rack and cook until bubbles form and the dough has risen slightly, 2 to 3 minutes on each side. The surface of the bread should be dry to the touch. Previous Previous post: Hungry for Change: FOOD, INC.